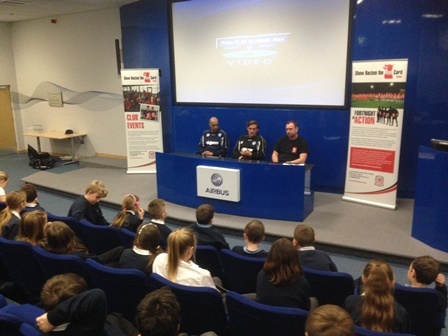 We visited the Hollingsworth stadium to host our educational club event with Airbus. Young people from Hafod-Y-Wern Primary school attended the stadium to take part in the event for the day. Our education team Steve Jenkins delivered a workshop in the morning to the young people educating them on the topic of racism using interactive activities and discussions. Pupils prior to attending the ground at school were set a task to prepare for the afternoons anti racism “press conference”. Airbus UK Broughton FC manager Andy Preece and player Glen Rule attended the event to take part in the press conference joined by Patron Steve Jenkins.